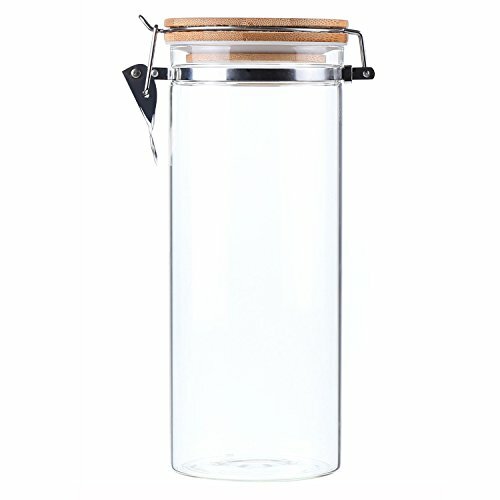 AUYE capacity jars(liquid oz):17oz,29 oz,40oz,55oz,68oz.Convenient sizes for all your kitchen storage. Maximize your shelf and storage space and benefit from the stylish look,with sleek rounded design.Its modular shape will create a tidy and organized look. AUYE capacity jars Made with durable glass that won't crack easily yet designed with a sleek style,allows you to see what's inside and how the preserved food is progressing. We have created a cohesive collection through style,quality,and practicality.We love to make your cooking experience simple & fun.We now offer a variety of innovative kitchen gadgets that will enhance your kitchen experience. SIZE: 500ML (17Oz) W3.9 x H3.1 Inches; 850ML (29Oz) W3.9 x H5.1 Inches; 1200ML (40Oz) W3.9 x H7 Inches; 1600ML (55Oz) W3.9 x H9.4 Inches; 2000ML (68Oz) W3.9 x H11.3 Inches. Great for use storing cookies,sugar,flour,spices,Coffee and other kitchen staples. Sealing ring with bamboo lid make the inside food cut off from the outside keep your food fresh. Superior resistant to use and dishwashing guarantees long lasting product. If there are any problem, please contact us, send your order number and take some photos of the product to us, we will arrange to take a replacement or refund your purchase asap. If you have any questions about this product by AUYE, contact us by completing and submitting the form below. If you are looking for a specif part number, please include it with your message.